i've been trying something a little new . . . gluten-free and/or vegan baking. this is partly because, well, i moved back to california. but also because my main baked goods audience has shrunk to the very lovely people who work for the somm. and they HAVE to like my baking! it's a win win win. i'd already gone down the gluten-free road for the yogi. and after having read about how terrible wheat is for you. plus there are so many fun types of flour out there! i now own about 10 varieties taking up precious freezer space. right next to my highly glutenized leftover bagel dough. whee! i do not yet have an opinion on what type of flours i like best. luckily, there are many wonderful bloggers who regularly share their wisdom. i've been spending time with gluten-free girl who has many great recipes and some really lovely writing on her blog. 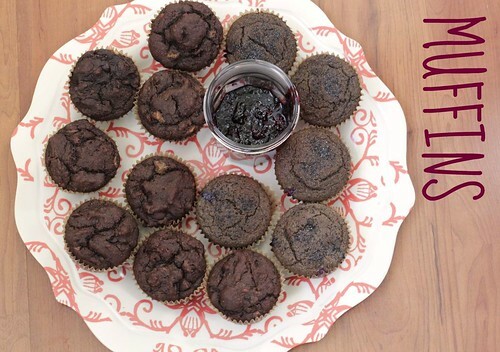 she has a great post on how to put together your own gluten-free flour blend. it doesn't require you to buy anything that sounds too crazy (xanthan gum? seriously? isn't avoiding words like that WHY we bake at home?). almond and coconut were my gateway flours. who doesn't like almonds and coconut? i pulled this recipe from the new york times, which also likes them some gluten-free girl. i skimped on the bananas – don't do that! add plenty of chocolate chips. almond, buckwheat and rice flour are the stars here, but next time i'd cut back on the buckwheat. 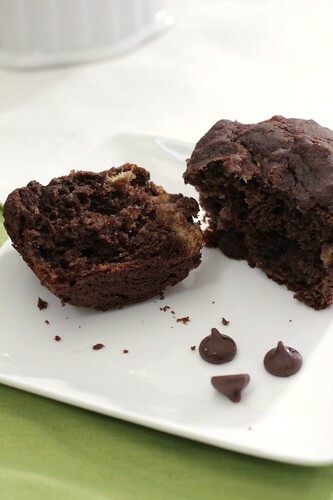 you want something lighter to really let the chocolate and banana sing. served warm out of the oven, these didn't immediately seem gluten-free. want a close up of that tender crumb? but do NOT give them to your vegan friends. there are eggs and buttermilk in there, the sneakers. plus, we've got something else for them. there are a number of vegan alternatives for eggs. so much good learning, and i would especially like to thank the kind woman who saved me from myself in the tofu aisle at the food co-op. yeah, i'll pause to let that sink in. caleeefornia! the tofu you want, that tofu is not in the refrigerator section of the market. it's the shelf-stable stuff. but i went for the flax seed slurry substitution. slurry! almost as good as shelf-stable tofu. just mix one teaspoon ground flax or chia seeds with three tablespoons hot water for every egg you're replacing. let the slurry sit, then add to the batter. ground flax seeds can be found in the oatmeal and hot cereals section, NOT with the various gluten-free flours and starches in the baking section. also, skip the honey and use agave. skip the buttermilk or yogurt and use unsweetened vanilla almond milk. double the blueberries. whip yourself up some blackberry jam. 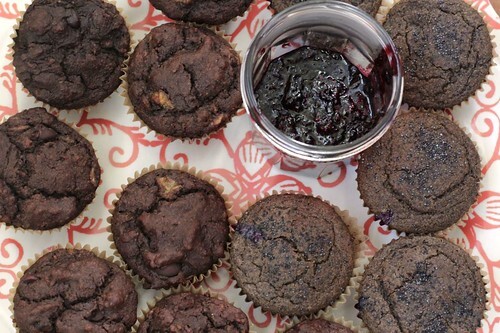 have yourself a muffin fest. *For the gluten-free flour mix I used about 70 grams of a mix of teff, almond and rice flour and 30 grams of arrowroot starch. Preheat the oven to 375 degrees with the rack adjusted to the middle. Oil muffin tins. Sift together the flours, baking powder, baking soda and salt into a medium bowl. Add any grainy bits remaining in the sifter to the bowl. In a separate bowl combine ground flax seed and hot water. Stir and let sit for a minute. Beat in agave, almond milk, oil and vanilla extract. Whisk in the dry ingredients and mix until well combined. Do not beat for too long; a few lumps are fine but make sure there is no flour sitting at the bottom of the bowl. Fold in the blueberries and poppy seeds. 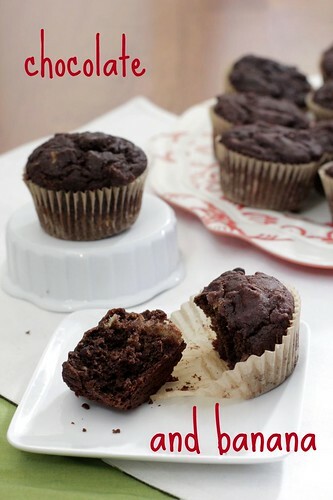 Using a spoon or ice cream scoop, fill muffin cups to the top. Place in the oven and bake 20 to 25 minutes, until lightly browned and well risen. Remove from the heat and if the muffins come out of the tins easily, remove from the tins and allow to cool on a rack. If they don’t release easily, allow to cool and then remove from the tins. Best served with some sort of butter product (that means Earth Balance for you vegans) and jam. Advance preparation: These keep for a couple of days out of the refrigerator, for a few more days in the refrigerator, and for a few months in the freezer. 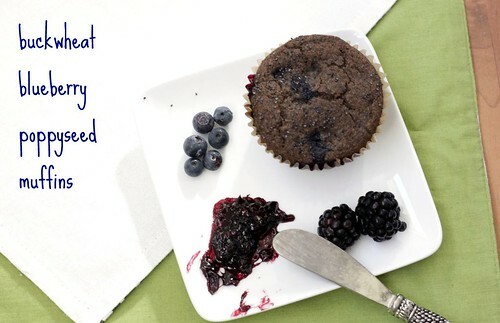 This entry was posted in Berries, Bread, Breakfast, Chocolate, DIY, Freezer Food, Gluten-Free, Healthy, Muffins, Snacks, Whole Grains and tagged banana, blueberries, blueberry, breakfast, buckwheat, chocolate, gluten-free, muffins by hilary924. Bookmark the permalink.